A listing presentation is an interview to represent a home seller in a real estate transaction. While a listing presentation can simply be a conversation with a homeowner, the best prepared and most successful agents include slide decks, visuals, and documents to demonstrate their expertise, build trust and win the listing. Before you start putting together your listing presentation, download your free template and go through the steps below. Your listing presentation should include an introduction to you as an agent as well as your team and brokerage, along with a discussion of the local market. Refine your pitch specifically to sell the homeowner’s property. When planning the pitch for your real estate information, the more information you have, the better. This information includes why the individual is selling, his or her timeline and what the expected price for the home will be. Here are the 10 steps to create the ultimate real estate listing presentation. Start your presentation with a brief overview of what they can expect and about how long your presentation will take. Go over who you are, what your real estate listing presentation will include and what you hope to also learn from them during the course of the presentation. While you might be a humble person, now is not the time for shyness around what you’ve done. Home sellers want an agent who is confident in what he or she can do, can explain how he or she does it and give examples. When giving a brief introduction of your skills, here are a few things to be sure to mention. If you approach your real estate listing presentation correctly, it’s not only a wonderful opportunity for you to sell your skills but a great chance to listen to the concerns the homeowner has. Listening now will show the homeowners you’ll listen to them in the same manner in the future. Be someone who is seen as effective yet empathetic and doesn’t overburden their time. Although a great listing presentation can be done in an hour or less, be aware that the homeowner has likely had experience with other agents who have spent hours and had an aggressive strategy we don’t recommend. Chris Mygatt, designated broker at Coldwell Banker in Colorado, offers all his potential clients a promise when he first arrives. He tells them that if his presentation is not making great business sense for them in the first 15 minutes that he’ll pack up his things and leave. Although most never take Mygatt up on his promise, it gives clients an out so that they don’t feel stuck. Be sure to encourage homeowners to ask questions at every stage of the listing presentation. You want to open up a dialogue with homeowners, instead of having them sit back and keep their questions and concerns to themselves to percolate. Actively encourage them to involve themselves in the presentation. After your brief introduction, take a few minutes to get to know your homeowners a bit better. Taking the time at this stage to get to know your homeowners encourages communication, makes the pitch far less monotonous, helps you angle your pitch to their needs and puts the homeowners at ease. Have you already found a home there? Is getting a good price or timing more important for you? What are you looking for in a listing agent? Are there any issues with the home that we won’t see today? Knowing this information will give you information that helps you angle your pitch to meet their needs and stress important elements as you go along. For example, if someone already made an offer on a home in another location, they might need to sell their current home quickly. You can use this information when you explain how it will take much longer to sell their home if it’s priced too high. Demonstrate to the homeowners what makes you and your team the best choice to sell their home. This is a great opportunity to talk about your success in the local market in much greater detail and to discuss specialties or any additional training or certifications you or your team members may have. If you’re a new agent or just starting out, you still have wonderful options to position yourself for the listing using our free template. For example, it would be important to focus on your marketing or tech knowledge, your relationships in the area or anything in your previous career that might help you sell houses. Show what you can do. If you worked in advertising, highlight your skills in creating great ads with some examples of your work. If you have photography skills, you can show a few photos from your portfolio that can make their listing stand out from the crowd. Here are two listing presentation examples from Keller Williams and Berkshire Hathaway that illustrate a successful approach. Every good brokerage will have at least a quick description of its benefits. Emphasize the value your brokerage offers that others in the area don’t. Be sure to present the homeowners reasons why signing with someone who works at your brokerage is a distinct advantage. Both large and small brokerages can offer distinct value. If you’re with a larger brokerage, like RE/MAX or Keller Williams, then you’ll want to focus on numbers like the number of homes your brokerage sold in the last year and median home sale price. If you work at a smaller boutique brokerage, you’ll want to emphasize things like personalized service. With a smaller brokerage, you often want to underscore personalization, distinction and the fact that your client won’t be just another file. When using our free template, here are some examples from The Premier Property Group, a smaller Florida-based brokerage, and RE/MAX, a national brokerage on the value of using their brokerages. You can see a snippet of their value proposition below. 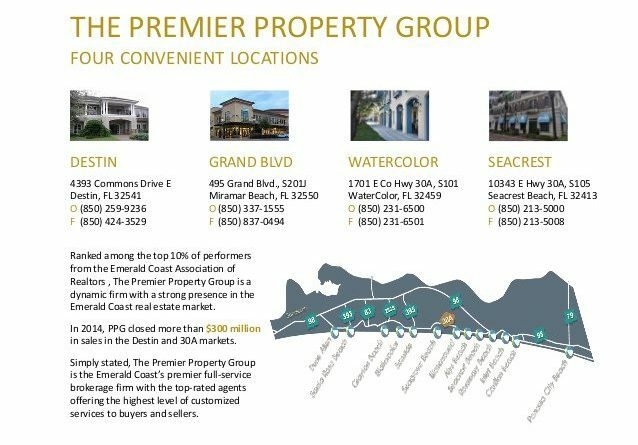 Value proposition of The Premier Property Group. Include local market data that shows historic trends, how quickly homes are selling in their area and any other information that will help homeowners understand the price you’ll set for their home. This data lends itself to charts or graph format easily. Be sure the numbers component is understandable for the average person. Here are some ideas of local market data you might want to include in your real estate listing presentation template. 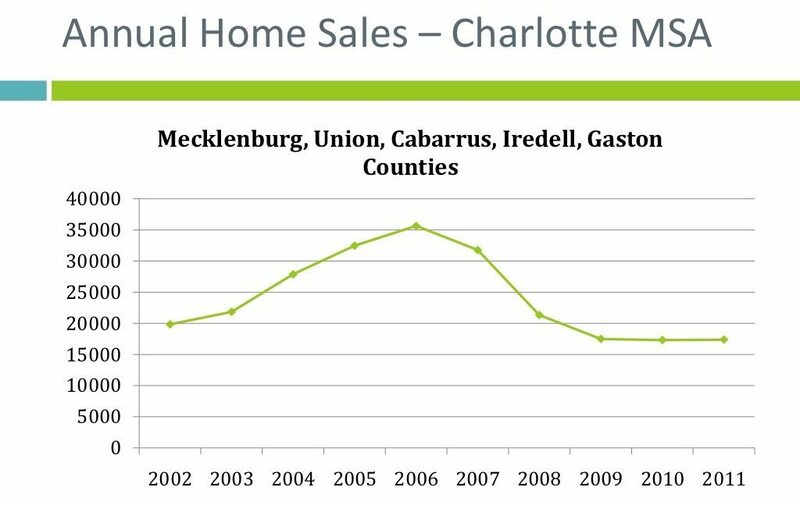 As an example of local market data, here is that portion of the information as presented by Charlotte House Hunter Group in their listing presentation. While you can certainly create these types of charts yourself, the more preferable alternative is to use the software your brokerage already has, or a paid comparative market analysis (CMA) and listing presentation software packages like Cloud CMA. The paid CMA software of Cloud CMA, for example, offers great premade charts and graphs that make you look like a pro and save you a lot of time. An explanation of how the sales process works can be extremely useful, especially for first-time sellers. Explaining how a home sale proceeds can demystify the process and help get everyone on the same page. The more homeowners know what happens behind the scenes, the more you can connect the value of hiring the right agent. While you might want to cover this more extensively for novice sellers, be sure to be brief with experienced sellers in these areas and meet them where they’re at. There is one exception to this. Usually, no matter how experienced your sellers are, you want to at least talk about communication styles throughout the selling process for both the sellers and yourself. What type of communication do they prefer and at what frequency? Do they prefer calling or a brief text? How will they tend to communicate to you? Unless they’re relatively new to the sales process, I wouldn’t go into too much detail on other elements, but be sure to leave information in case they wish to review it when you leave. For most Realtors, the marketing section will be the most important component of the listing presentation. Great marketing and sales skills are what moves houses. 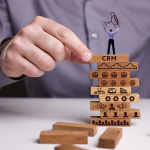 Generally, it makes sense to focus on what marketing skills and tools you can bring to the table as well as how you can apply them to their home specifically. Here are particular areas to focus on when presenting your marketing strategy in your template. Whether you have your own internet data exchange (IDX)-enabled website or use your brokerage’s website, your online presence will be a big selling point for most homeowners. Emphasize if you use IDX, which allows their listing not to only be featured on your sites but also on the sites of dozens of brokers with IDX websites as well. Discuss how many visitors your website gets, how it is designed to function and how sales oriented your site is. For example, talk about placing their home as a “featured listing” in front of hundreds of visitors or if you can offer the sellers a single property website. If you have examples of single property websites you’ve built for other listings, now is a fantastic time to highlight those including screenshots and the resultant sale. If you have never built a single property website, they can be a great selling point. We talk about the best single property website builders and have an extensive review of who to use and price points to start. Explain how professional photos helps sell homes faster and include examples of great photography from your previous listings. Without great photographs, client listings aren’t going to get many clicks on your website or views on Zillow. One effective method of showing the benefit is to provide before and after comparisons of a listing with amateur pictures to one with professional pictures. If you feel that you need to improve your own photo skills, read our in-depth guide to real estate photography for tips you can use. 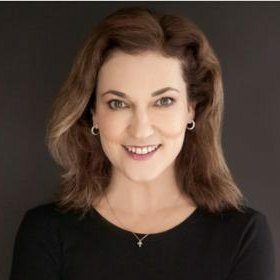 If you’d rather hire that task out but don’t want to spend a fortune, check out BoxBrownie.com. This real estate photo imaging service offers photo enhancement for $1.60 per photo and day-to-dusk editing for $4 per photo. Click here for a free trial and get 3 image enhancements plus 1 day-to-dusk edit when you sign up. If you’re a Zillow Premier Agent, you can explain how this designation will benefit their listing. Since you will be the expert on their home, you can explain that having leads contact you first will lead to more showings. Most people do not realize that if a general buyer’s agent gets the lead, they might just steer them toward one of their own listings. Zillow Premier Agent won’t only help you close seller leads, it will also help you get more buyer leads as well. To learn more about the exclusivity that Zillow Premier Agent offers, see our guide to how Zillow Premier Agent works. If a seller’s home will be vacant at any point in the sales process, you can explain the benefits of staging and virtual staging. Be sure if you have experience in this area that you include some photos of before and after staging or virtual staging in your listing presentation. In most cases, sellers can be incredibly grateful to a listing agent who understands virtual staging once they see the benefit. Services like BoxBrownie.com allow you to pay per image, making it a cost-effective option for potential clients who want all the perks without breaking the bank. Be sure to show the seller a few good pictures. Most will be astonished at how realistic it looks, and the photos will explain the benefit better than anything you can say. Click here to try BoxBrownie.com for free. If you want to learn more about virtual staging, check out our in-depth guide here. Make your listing presentation stand out from your competitors by including drone footage and a sample virtual tour from a previous client. Once a homeowner sees the tools at your disposal, the impressive nature of them might be what cements the deal. Drone footage can showcase a property as few things can. Average properties become more majestic with drone footage, and it captures the expanse of homes that are large or have large portions of land. To learn more about using drone footage, we have a drone photography and video guide that will help you get the skills to improve your real estate listing presentations. Most homeowners can understand the value of a 3D tour like Matterport, seen above, can provide. Giving a real feel of the property as if you are walking it yourself can add something far more alluring than still photographs. It used to be thought that video tours were only for individuals who could not visit the property personally. However, but video walkthroughs are becoming a standard feature. In fact, Zillow even ranks its listings that include video posted through their Zillow Premier Agent App higher than other listings. A quick overview of how your local MLS works can be helpful. You should explain how the MLS makes the home available to agents everywhere, that their listing will be available for buyer’s agents to show to their clients once posted and how the process generally works. It is particularly useful if the listers are first-time sellers or for sale by owner (FSBO) leads, so to explain how they are not able to add their property to the MLS on their own. Explain that the services you provide as a seller’s agent are extensive. Many people truly believe that you will place their home on the market and call it a day, so be sure to outline the other areas where you market directly to buyers. If you’re looking for more marketing ideas you can pitch to your homeowner, check out our list of 52 creative real estate marketing ideas here. Case studies of other homes you have sold is an extremely effective marketing tool if leveraged properly. Using homes that are as similar as possible to the homeowner’s property, and being able to show a history of selling quickly for a solid price can open the door for you to discuss how you did it and your unique marketing strategy further. If you have a potential client who is currently trying to sell by owner, for example, include examples of FSBO listings before and after you got the listing. Focus on improvements in marketing as well as the numbers and discuss how these sold the home. We all know that improvements in things like photography, staging or virtual staging and marketing can make all the difference. However, sometimes, it takes real-world examples to give homeowners impact. Feel free to include images like this in your real estate listing presentation template to show value. 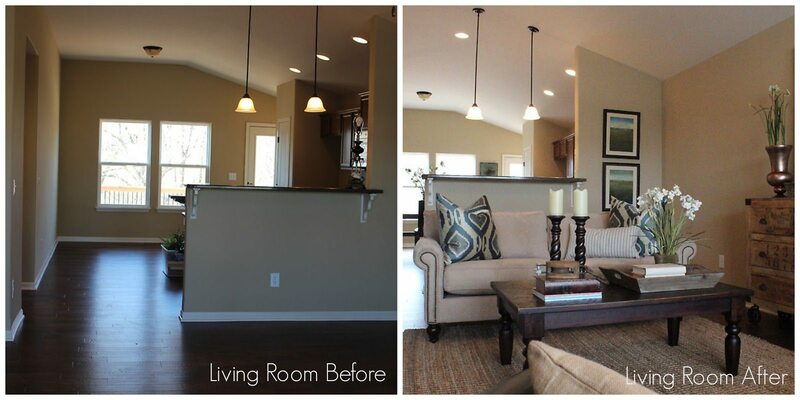 A before and after example of staging a home for photos. The crux of every listing presentation is the focus on pricing strategy. This is a phenomenal opportunity to explain how pricing their home right the first time will save them money in the long run. Be sure when outlining your pricing strategy, that you highlight exactly how elements such as square footage, updates, number of bedrooms and market fit affect local pricing. Including specifics in how you approach pricing as well as outlining how this makes their home more or less likely to sell. Do what it takes to help the homeowner understand how pricing works and how you approach what you do for the best result. 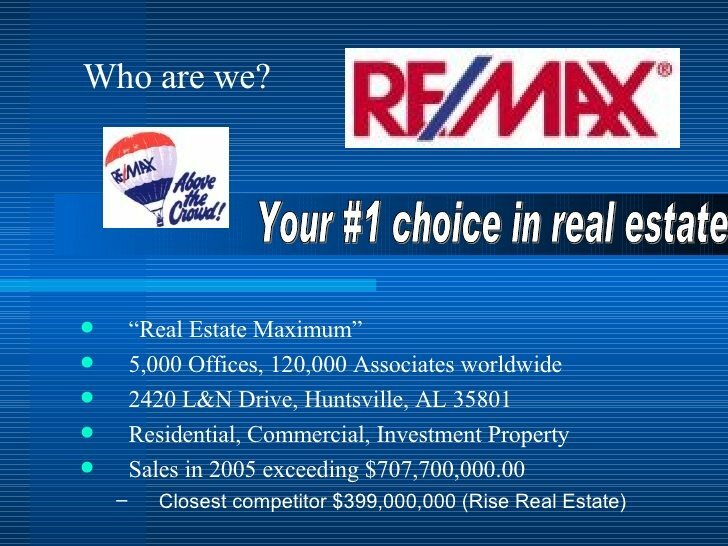 Slides like these are great to include in your real estate listing presentation template. 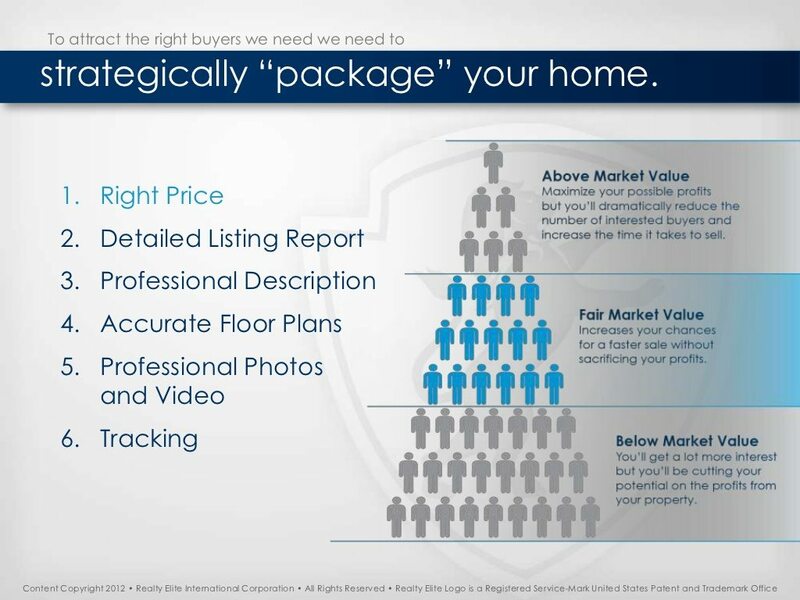 Realty Elite’s listing presentation slide explaining to prospective sellers the importance of pricing their home right. If this is your first time in a prospective client’s property, then most agents recommend holding off on the CMA until you’ve toured the home and done your homework. Assessing value can be very difficult if you’ve never seen the place in person, or if you discover the home has something like tax liens or structural damage. When the prospective client talks about pricing, this is a good time to mention these kinds of issues and ask if they have anything you don’t know about that may affect the value of their home. Also, tell clients that you would never think about pricing unless you’ve done your own homework on the property and get to know it better. If this is your first time seeing the home in person, then you should probably reschedule a time to go over your CMA in detail. The true benefit of scheduling your CMA for another appointment is to keep in contact with the lead. 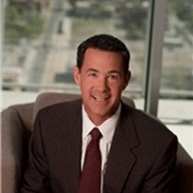 Adam Hergenrother, has a real estate team ranked number 33 in the nation by Real Trends, and is the CEO of Hergenrother Realty Group in Vermont. Hergenrother recommends having potential clients come to your office for your CMA presentation and shares his process. Sometimes, homeowners may want a pricing opinion on the spot. If homeowners insist on getting your opinion on pricing, be prepared to show them any preliminary research you’ve done as well as how anything you’ve learned on your listing presentation that may affect the price. If you have already toured the home and know about its quirks, then you should present your CMA. Be sure to explain how and why you picked your comparisons as well as any other details of how you arrived at the price for their home. If you’re new to real estate or would just like to brush up on your skills, we show you how to run a CMA. Now that you have the 10 elements to include in your listing presentation and a free template to expand on, we have a few tips on how to make your pitch. What is in your presentation will be based on your experience, market, and client, but your approach can make all the difference in the world. You will have the time and space in your listing presentation to highlight your skills and abilities. However, no matter how fantastic your reputation, clients are focused squarely on how those things meet their needs. For example, instead of focusing on a recent award, talk about why you got that award and what it means for your potential client. Saying you’re an award winner is meaningless to clients unless you can show them why being an award winner will help them get a better price for their home. Every homeowner is different, and you need to tailor your listing presentations accordingly. Be sure as you work through your listing presentation that you are flexible enough to either go into more detail when warranted or skip certain sections. For example, if your homeowner is tech-savvy, then you should spend more time discussing your website’s IDX integration, lead captures and anything else tech-related. However, if they’re retired and don’t know a landing page from a sailboat, you might want to spend much less time going over your technology and more time talking about your connections. If you do end up glossing over sections of your presentation, always remind them that you will leave behind more details if they get curious later. Often, if there are elements people do not understand, they might ask a friend or family member to review what you’ve said and give their opinion. 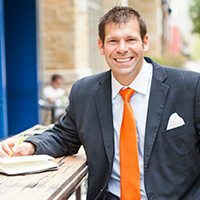 The Maya Angelou saying is true: “People will forget what you said, people will forget what you did, but people will never forget how you made them feel.” While this might seem like a vague platitude, it’s a tried-and-true sales tactic that you need to keep in mind when planning your real estate listing presentation. While most people will say they are logical in their decision making, research tends to suggest otherwise. According to Harvard Business School Professor Gerald Zaltman, we make up to 95 percent of our purchasing decisions subconsciously. Think about the last phone or tablet you purchased. Chances are your decision was made based primarily on emotional reasoning rather than logical reasoning. Even if you have a laundry list of logical reasons for making your choice, psychologists say that these are often justifications for an emotional decision you’ve already made subconsciously. Be sure to leave your listing appointment making the homeowner feeling informed and better for working with you. You don’t really have to be a “people person” to succeed in real estate, but you do need confidence. One of the biggest misconceptions people have of successful real estate agents is that they’re all naturally confident. Great agents can display confidence because they know their abilities, even if they might not be confident by nature. The best way to develop confidence if you’re lacking is to know the market inside and out. Be learning new skills constantly, trying out new software and perfecting your craft. Confidence often follows time, study and effort. Software that helps you illustrate your point with visuals, like CMA Software, can be very helpful during your listing presentation. 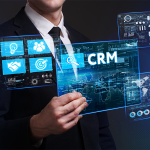 While we ranked Cloud CMA the best CMA software that agents can buy today for their work, we find that homeowners tend to like the functionality as well. Although Cloud CMA can present some amazing visuals, you should stay extremely cautious of over-relying on those visuals to tell the whole story. For most of the homeowners you’re going to be pitching, remember again how you are making them feel. People do not feel valued if you are swiping through pages on your iPad, but they do feel valued if you talk, look them in the eye and take the time to explain the answers to their questions. In order to get good at something, you need to practice. In order to get great at something, you need to practice a lot. 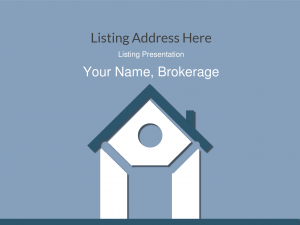 Because you need to be great at giving listing presentations, you need to practice a lot. Role-playing with a co-worker or family member is a great way to bring your listing presentation off your laptop and into reality. You may be surprised to find that lines that sounded great in your head fall flat with other people. What Software Should You Use for Your Listing Presentation? At the end of the day, the software you use doesn’t really matter that much. If you write a great listing presentation, you can certainly use your free template and seal the deal. However, professional CMA software like Cloud CMA does have some advantages and can make your presentation shine on an iPad or tablet. While we offer a free template for you to customize, using software like Cloud CMA can have advantages. With Cloud CMA, for example, you can also send them a link to their CMA that updates in real time. Another benefit is that they have extensive prewritten slides, charts and graphs, describing the sales process and showing the benefits of working with a Realtor. You can also add video, Matterport tours and other interactive media, making it easy to throw something together if your listing appointment is happening in a few hours rather than a few days away. Here are some listing presentation examples you can use to structure your own as you use your template. Preparing a great listing presentation can be a challenge, but once you know the rules of pitching as well as the right content to include, the only thing left to do is to practice and go out and land listings. By showing interest in the homeowners as well and showcasing your own skills and expertise, you can become the obvious choice to sell their home as well as the person they genuinely want to work with. If you’re still searching for wonderful software to construct your listing presentation, we highly recommend Cloud CMA for a professional and polished first impression. Sure. Google Docs works on both Macs and PCs. You can (and should) make your presentation your own though. Yes, you can (and should) frequently change your presentation as you business grows, and as you hone your pitch to find out what works. The best prepared and most successful agents include slide decks, visuals, and documents to demonstrate their expertise, build trust and win the listing.